You can see this design doesn’t use breadboards or aprons. Can you guys give me an idea of what supports should go on the bottom to help keep this top flat and strong? 6/4 ash stock, looking at something like 40”x72”. There have been recent discussions on this forum about similar designs. The issues have been the strength of the bottom miter joints and similar ones at the top. Also of concern should be the longitudinal stability (racking of the legs when someone pushes on the table end). The bottom joints should be dovetailed or fingered. Similar joints at the top should be the same. Longitudinal rigidity would be improved by a leg to leg brace from the center of the bottom horizontal members. These joints should be mortise and tenon. IMO, the pic above takes away from the design and provides little strength. With designs like this, one has to except some amount of fragility. Personally I think the design is fine provided proper joinery. Tops stay flat with good joints and a proper glue up. I would finish both sides as well. I’m of similar mindset that a stretcher all the way at the bottom provides little additional strength. I’d probably be more prone to add a stretcher at the very top of each leg, oriented like an apron. They could even be placed inside of the legs in order to inset even further. This would be inset, and high enough up, where it wouldn’t be apparent from most angles so as to not take away from the modern design. Though they should also provide much more support against racking if done with M&Ts. 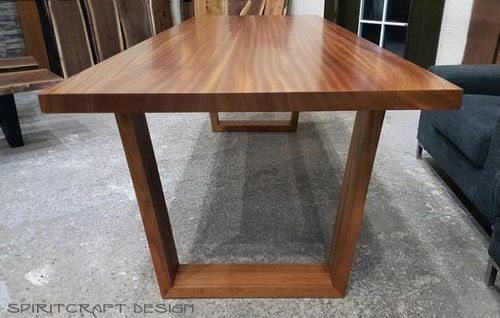 This was a coffee table design that was scaled up to dining table design. What works in a squat coffee table won’t necessarily hold up in a dining table. I would run an apron between each leg. With the legs set so far back you’ll never see the aprons without bending over. Lag bolts aren’t enough to keep this thing from racking. So most are of the opinion that the table as is will be somewhat fragile. A brace at the bottom may or may not add significant support. Leg to leg braces at the top (aprons) would be ideal. 1) I’m not good with dovetail joints yet, would box joints for the legs be sufficient? 2) If I do inset some aprons, are longitudinal sufficient or would I also need to go across? 3) If I do aprons, is there anything else that should go under the table top to strengthen it? And can someone remind me what racking is? When I look online it’s all about wine racks…. And can someone remind me what racking is? When I look online it s all about wine racks…. The longitudinal supports (aprons) would prevent the racking by adding structure to prevent the legs from moving independently and from rotating on the top fulcrum (the attachment to the table top). You wouldn’t need diagonal bracing. As for the question around any additional top support, I wouldn’t think any is needed for 6/4 ash going a distance of maybe 50-some inches, but you could consult the sagulator for validation… Of course, a single cross brace between the aprons probably wouldn’t hurt anything either…. I m of similar mindset that a stretcher all the way at the bottom provides little additional strength. I d probably be more prone to add a stretcher at the very top of each leg, oriented like an apron. Respectfully disagree. While having the stretcher all the way at the bottom may not be ideal, if properly joined with M&T it would add greatly to the rigidity. There should also be an upper horizontal member to the trapezoid securely bolted/screwed to the bottom of the table top. IMO, laying flat (or near to) on the floor, repeating the other horizontal members, it would be more in keeping with the over all design. A stretcher part way up would be a great distraction aesthetically. So now I’m hijacking the thread… But what if the legs were say 5” wide at the bottom, and 10” wide at the top. Wouldn’t that vastly reduce the chance of racking without the need for stretchers or aprons? I like the looks of this table, however I prefer having single points/legs contacting floor. Then you don’t have to worry about rocking on uneven floor. Structurally a stretcher would be a good idea, but also gives a person a spot to put there feet. Thank you for the explanations of racking, makes perfect sense. We’re going for a modern design and would like the trapezoid legs to work of possible. That said, I don’t want to spend the time and money building something that we end up resenting every meal because we prioritized form over function. I also don’t think adding a stretcher across the bottom will add anything significant. Sure to a very small degree an M&T joint would resist racking, but the force are across the thin direction of the this stretcher. The legs are 5” wide, and could be made even wider without detracting from the design. That 5” width attached to the table top is going to resist racking a lot more than a stretcher at the bottom. At best the bottom could be viewed as a very narrow version of the top. Only time I see a bottom stretcher helping is if you lifted one end of the table and all the force was on just one leg set. In this case that stretcher would help. As far as aprons, I don’t see the need. Of course it would add more structure and would be stronger, but I think it would work as is. First, again the legs are 5” wide. This is not a case with a 2”x2” leg at each corner where the leg really attaches to the apron and the apron to the top. This is more like a table with very large post type legs. Where the leg is large enough to be directly attached. Keep in mind that the 1.75” thickness of the leg material is itself a substantial fraction of the width of an apron. Again, the 5” width of the leg will resist the racking for a load like pushing against the end. It would be critical that the leg assembly by firmly attached to the top. Though the attachment must allow for the wood movement of the top. As to side to side racking, with strong joints like finger or dove tail, the 1.75” thickness is going to be extremely strong. I can’t see this failing. 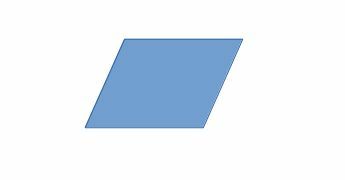 The trapezoid shape doesn’t make it stronger or weaker. Though certainly the joints getting trickier to make. But it is more stable. For the trapezoid to rack, one side of the table must lift up. So the weight of the table itself wants to keep it in it’s normal position. There’s no question common table designs exist because they are proven to be strong and functional. Something like this that deviates from that is going to be less strong, but that doesn’t mean it isn’t strong enough. And the leg design is not frail. That’s pretty good size material. What I would consider doing is mocking one up using some construction lumber. This would be cheap to try and it would also give you a chance to work out the details of making the odd angle box joints. 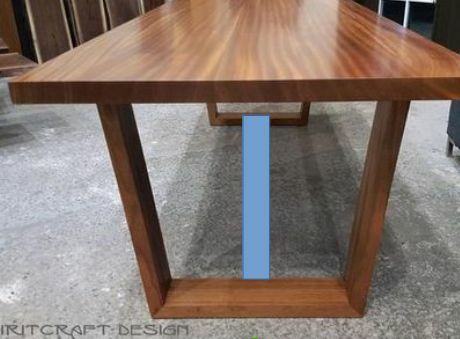 There should also be an upper horizontal member to the trapezoid securely bolted/screwed to the bottom of the table top. This would provide zero strength. The only thing it’s providing strength to is the top board. That board would be lagged to the top in at least 6 different places. It’s not going anywhere already. The weakest point on the design is the upper miter. If will fail/flex/rack before anything else. The only way to stop it is to reinforce it. Which takes away from the design. The design is plenty strong. Just know that it’s not going to be like having 4 legs and skirt. I was referring to the top member of the trapezoid (which we assume is there. It’s not shown) and stated that the top corner joints should be dovetailed or fingered. I agree that a mock-up would be a good idea. You might also try to find someone who knows how to do the math for a structural analysis. Only time I see a bottom stretcher helping is if you lifted one end of the table and all the force was on just one leg set. In this case that stretcher would help. Have you ever seen someone lift one side of a table and then drag the other legs across the floor in order to move it. I have. This puts a tremendous amount of racking force on legs. When designing a furniture piece, it is important to consider what happens when it gets moved; not just stationary. I worked in the moving industry a long time ago and I’ve seem what movers can do. I agree that the bottom stretcher is a compromise. However, it is the only solution that fits the design. While an apron would help strengthen the top connection, it would not help much in resisting racking forces at the bottom of the legs. And, any bracing midway up would not be in keeping with the design.